Many homeowners find themselves short of storage space in their homes and dream of a nice, tidy storage shed in their yard. They put off building one, though, because they dread the time, construction mess, effort and expense that is involved in such a project. Perhaps they lack the necessary construction skills. That is where we can help. Salem Structures, LLC sells, delivers and installs quality Amish built storage sheds that will help you meet your storage needs while increasing the value of your property. The savvy homeowner knows the value of maintaining a home’s curb appeal. 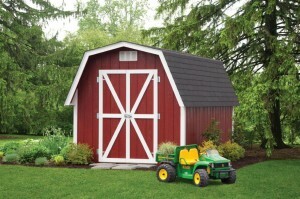 That is why our storage sheds are available in a wide variety of styles, colors, sizes and finishes. You can match your shed to your home. We have Cape Cod, Victorian, Cottage, Mini-Barn and Carriage House designs as well as unfinished wood siding that can be painted in your home’s color to match it. We can even match the roof. We have structures as small as six feet by six feet to ones as large as 16 feet by 40 feet. We can also combine several buildings in to one extra large one. If you need something special, we would be happy to provide a free quote to you. 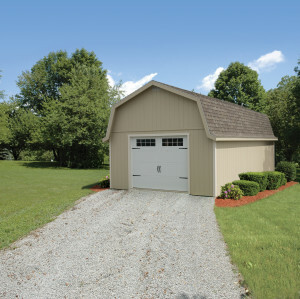 Portable modular garages are also very handy storage buildings to own. They’re especially great for storing recreational equipment, ATVs and medium sized to compact tractors and all their accessories. If your teenagers are driving and there are extra cars in the driveway now, you will have a place in which to park them out of the weather. Perhaps Dad needs a man cave and there is no space in the house. A portable garage is perfect for his needs. Then let Mom choose one of the high quality octagon Amish gazebos she has always wanted for her garden. Purchase the screen package with it to keep the bugs out and the whole family will get more enjoyment from the back yard. It will also increase your property value. We also have structures for the animals in your life. We specialize in all sizes of horse barns. We provide a variety of stock designs whether you need a run-in barn, a single stall or our eight stall barn with center aisle and hayloft. We are also happy to design and build a barn to suit the needs of you and your horses. All structures are delivered fully assembled and without charge within 20 miles of our Salem, Ohio location and our new Hanoverton, Ohio location. A small mileage fee is charged over twenty miles. Call 330-332-9940 to let us know what we can deliver for you.